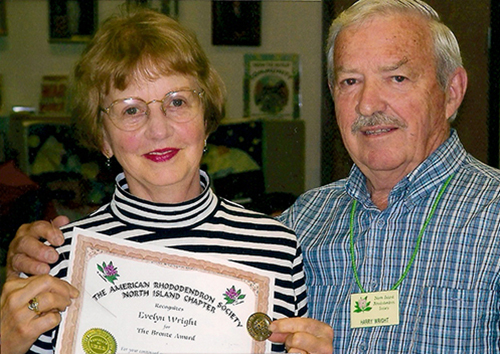 At the September 2008 meeting of the North Island Rhododendron Society, Evelyn Wright received the Bronze Medal, the chapter’s highest award. A long-time member of the Society, Evelyn at most socials is pouring the coffee, and supplying the goodies. Should she be missing, she can probably be found in the kitchen. She is always a willing worker on garden tours and plant sales. For many years, Evelyn handled the Publicity and organized the club’s annual fundraising Garden Tours. Evelyn is a hard working member and very deserving of this award.